Motivation is the desire to do things. It's been given the credit for making or breaking success. We used to think it struck like lightning when we had epic ideas or wanted to achieve something cool. But what is motivation really? How do we make it? Where does it come from? Is it external or is it always within us? There is more to it than whether you have it or not.. there is more to motivation because it is always created internally and it is therefore always a choice. So lets go into how Motivation works and try to make the lightning strike a little more often, hey... But before we go much further, here's a task for you. Write down at least 1 thing you want to achieve over the next 3, 6 and 12 month periods - think performance, health, personal life, work life. If you struggle with this, attach those dates to special occasions or work events to place some reality around them, ie Christmas, a family reunion, your best friend’s birthday, a wedding or work trip. Engaging in a behaviour because it means avoiding punishment or gaining a reward. Intrinsic motivation involves "engaging in opportunities because they are seen as enjoyable, valuable or relevant to meeting one's core needs" (Augustyniak et al, 2016). In recent research, intrinsic motivation has been highly correlated to high levels of effort and task performance. And importantly, higher intrinsic motivation is linked with higher persistence (Augustyniak et al, 2016; Sturges et al, 2016). 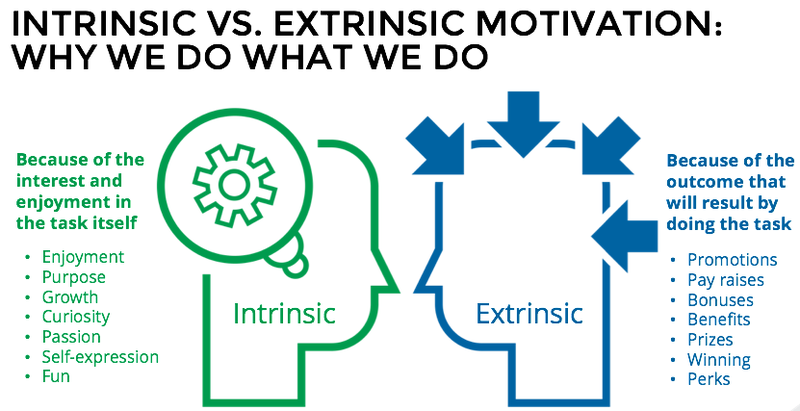 Therefore intrinsic motivation is the more powerful tool, and responsible for longer lasting persistence and results, as opposed to extrinsic or reward based motivation. Pull motivation requires you to tap into something you want to achieve. The achievement 'pulls' you towards it, and in coming closer to that activity or meaningful pursuit action is inspired. Pull motivation drivers can be long-term with intermittent benchmarks, that fulfill our need for constant reinforcement! Whichever of the four resonates with you and your aforementioned goals - extrinsic, intrinsic, push or pull - there is no denying that pull and intrinsic motivation are the most powerful and change-inducing forms of motivation. It can be hard to tap into the emotive power of a pull motivation driver, so we've compiled a sequence of questions that can help you harness a strong motivator to bring you closer to your goal. Without a goal that resonates with things you like, enjoy or spark your interest, the feeling of motivation is short-lived. The then overarching feeling of failure or disappointment of underachieving can be a detriment to future endeavours - memories and emotions are strongly attached, don't let that attach to the word or exercise of a 'goal'! So how do we harness this emotive power and attach it to our goal? STEP 1: was your goals at the start of this blog, that one is complete. STEP 2: Now, go back and number each goal in each segment in order of importance. For example, out of your 3 Month Goals, consistency with diet and less processed food may be #1, with #2 being to move your body in some way daily, and #3 to lose 4kg. STEP 3: This requires you to delve into your experiences and imagination. What happens if you don’t achieve these? Does it matter in the long term? If you continue with the habits you currently have and don’t make these changes, will you achieve your 12 Month Goals? What will you health, appearance or performance be like without making these changes? And can you afford to take the risk of not changing these habits right now? STEP 4: We know that intrinsic motivation sparks via interests and curiosity. If that's the case, what elements of what you enjoy can you include in the plan to reach these goals? For some it might be walking daily, or listening to an audio book as you go because you love learning. Others it might involve lifting weights often, doing sprint training, or doing your training outside on a regular basis to boost your enjoyment factor. This is where things become personalised because not everyone likes the same things, nor are they motivated by the same things. From here, the rest is up to you.. The biggest thing to remember is that this is an individual, personal journey and the limits to your potential are only that which you put in place!